A questioning of humanity's place in the universe, marked by an interest in self-reflection, mortality and meditation. Spirituality is often associated with things that are mysterious, felt before they are understood, and beyond the scope of human thought, time and history. Distinct from religion, spirituality is an attitude and not an organized set of rituals or beliefs. ART:21: Do you see any links between praying and fasting - practicing your religion - and the process of making art? SIKANDER: I think the hard part is when you're out of practice. ART:21: The hard part of what? SIKANDER: Oh, the hard part of the lack of discipline is when I feel less productive. Like, if I am painting regularly and there is a certain structure and certain discipline that is being brought into the studio, my mind works better, I have better ideas. I'm able to accomplish far more. I'm able to move on to the next stage. But the minute that discipline leaves the studio, everything gets very scattered. And even times in life when things have gone to extremes, I do get back into a certain notion of spirituality where I need to be by myself, or I need to read, or I will fast, or I will do things which make sense tome, and which allow me to come back to that space. So the same way when I am working large and I paint and I do murals, and the next thing is I come back to miniature painting. It's just this whole dichotomy of experience. I do always come back to miniature. I can hate miniature for a while and I want to move ahead because it's frustrating, because of all the different reasons of doing something so labor intensive without much critical structure, which becomes exotified, and which takes years to make. So it's like always, "Why do I do this?" And I let go and do something else, but I always come back to it. And maybe because by the sheer act of doing it is what gives me a certain sort of peace. Tut, Tut ... Just Another Entertainment Event? It's all things Tut in L.A. this week. I happened to be in the bowels of LACMA yesterday and the energy was high. Security was tighter than usual and media types were everywhere. Look forward to long lines, expensive merchandise and fluff pieces appearing in news outlets across the country. "I hate to say this, but it's very similar to how we would go market another entertainment event, like a major awards show or sporting event," says Tim Leiweke, president of AEG, the sports and entertainment presenter that developed Staples Center, among other venues, and is financing the exhibition." when the British archaeologist Howard Carter opened his coffin. The objects in the exhibition are magical. They bring us to another time. 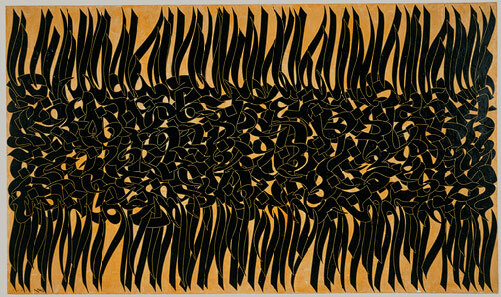 And they help illumine the artistic legacy of Africa and what is now the Arabic world. But there is something of the grave robber in all of this. 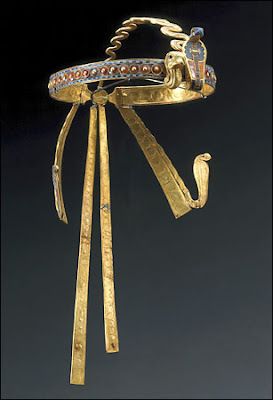 Howard Carter removed the crown (shown above) from Tutankhamun's head and, as documented in the recent National Geographic cover article on Tut, Carter desecrated Tutankhamun's well preserved corpse which had become tightly fastened to his coffin by laying the mummy in the scorching Egyptian sun to melt the hold between Tutankhamun's body and its 3200 year-old resting place. Tutankhamun's legacy should inspire reverence for humanity, not for gold or the dollar. "I've often said that if I could start a museum from scratch, it would be diamonds, dinosaurs and mummies — those are the three home runs in the museum world," says Peter Keller, president of the Bowers Museum. Look where the mad pursuit for home runs got Barry Bonds. Should we put an asterisk next to Tut's future attendance records? I hope that the exhibition leaves LACMA in a sound state when Tut is over and the crowds clear. But I wonder, what does the financial deal with AEG look like? I worry that this will set a precedent of art exhibitions being run by entertainment presenters. Is this the start of a trend? My reverence for LACMA runs deep. When I was 11 and just starting to paint, I would carry a sketchbook around the museum and make visual notes on the paintings. Later while at UCLA, LACMA was my artistic refuge. Currently, I have a painting illustrated on their website. 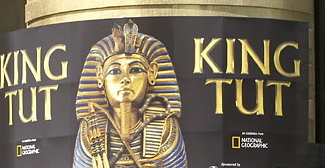 It is my hope that the massive media attention on Tut will not pull the museum too far off course. I'll return to LACMA during Tut but look for me in the Japanese Pavilion. An exhibition of over 125 prints produced in a marathon weekend of Bay Area print workshops. 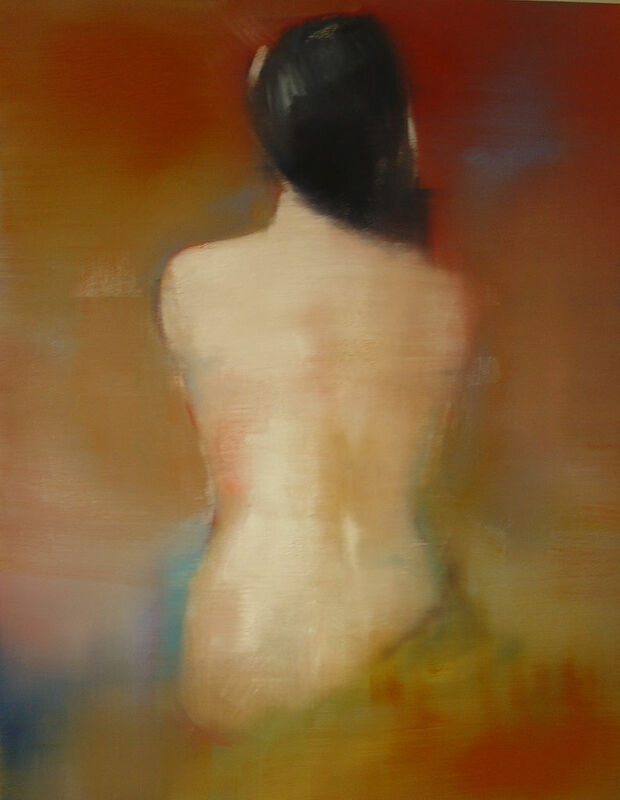 Spontaneity characterizes the monotype. A monotype is made by brushing printer's ink or oil paint onto a smooth surface such as glass or a metal plate. The image is then transferred to paper before it dries, using a printing press or other means of pressure. Because most of the image is transferred in the printing process, only one strong impression can be taken, hence the term monotype (one print). Additional impressions of the residual image are sometimes printed (ghosts). They are significantly fainter than the first pull, yet at times these lighter open images are more successful as works of art. The personal nature of the monotype suited experimental artists from William Blake to Edgar Degas to Milton Avery. The English artist William Blake used the monotype process to fashion works of great depth and mystery. Blake's monotypes were created with egg tempera painted onto board, which rendered a textural surface when printed onto paper. Blake would then go back into the works with ink and color to develop the imagery. The National Museum of American Art, Smithsonian Institution, exhibition from 1997: "Singular Impressions: The Monotype in America" produced an informative video on The Monotype Process. 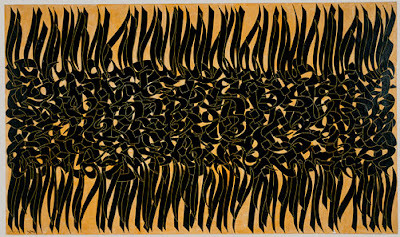 JL at modern kicks wrote in with the original source for the contemporary art in Iran link in the article below. 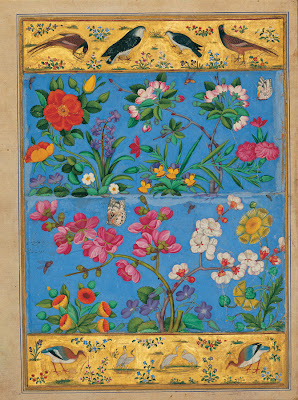 It was originally on the Metropolitan Museum of Art website under modern and contemporary art in Iran. JL was particularly pleased to see the work of Farah Ossouli discussed. Both Farah Ossouli and the Pakistani artist Shahzia Sikander "appropriate the language of miniature painting, yet re-present it in a contemporary idiom." 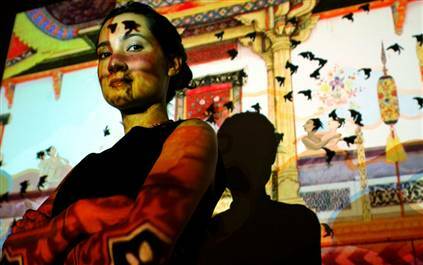 Nice clip of Shahzia excerpted from the PBS documentary series Art:21 — Art in the Twenty-First Century. JL also dreams of going to Iran one day. 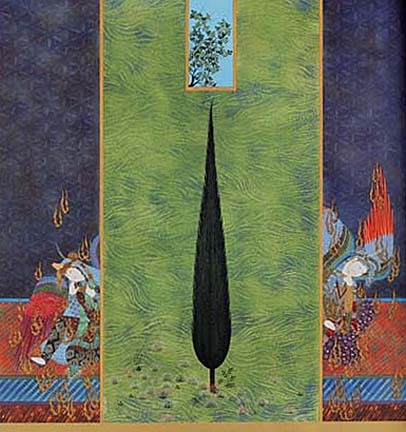 Any way that we can arrange an art blogger tour to Tehran? "The Flower and the Bird"
While researching some of the artists in the exhibition I came across an article on contemporary art in Iran which provides a nice introduction to a culture that is sadly undervalued in the West. 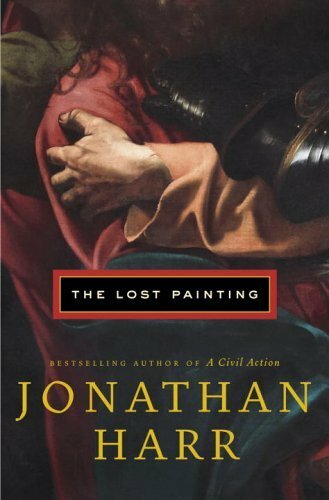 Jonathan Harr's new book "The Lost Painting" is being billed by Random House as the true story of a search for a lost Caravaggio. The book is scheduled to be released in November. "The Lost Painting" will be remembered as one of the last works pitched to the press by Jonathan Karp who resigned this week as the editor in chief at Random House. "Jonathan Karp of Random House optimistically called Jonathan Harr's "The Lost Painting" "a page-turning work of suspense about the mysteries of a religious painting." "We showed lots of restraint," Mr. Karp said. "We didn't call it 'The Caravaggio Code.' 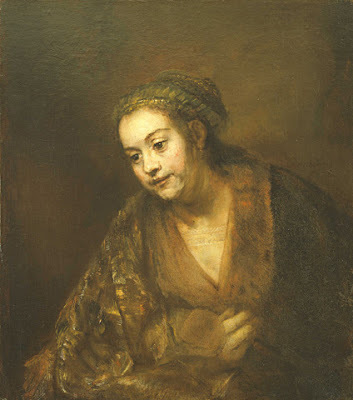 "
The exhibition "Rembrandt's Late Religious Portraits" opens today at the Getty Museum in Los Angeles. "Hendrickje Stoffels, Possibly as the Sorrowing Virgin"
Tyler Green's thoughts on the exhibit during its first stop in D.C. bring up an important question, "No one knows why, near the end of his life, Rembrandt painted so many religious figures who devoted their lives to spiritual goals and who were killed for it. Arthur Wheelock, the NGA curator who put together this show, brought these paintings together in an effort to spark some thought on the question." "Just as now is a time of battle in the Middle East, so too was the Netherlands in Rembrandt's time. In the seventeenth century the Dutch fought wars with the Spanish and the British. The First Anglo-Dutch War ended in 1654 (and naval skirmishes continued for years), just a few years before Rembrandt began the paintings shown here. As with Vermeer's paintings, you'd never know that Rembrandt lived surrounded by war. (The presence of several hushed Vermeers in a gallery adjacent to the Rembrandt show underscores this point.) Rembrandt's quiet portraits reject blood and violence in favor of humility and introspection. I can't help but think that's part of why they still look so great today." Tyler's recognition of the humility and introspection in Rembrandt's late portraits is a point that bears repeating. I had a chance to speak with the painter Chester Arnold this weekend whose "To Never Forget: Faces of the Fallen" exhibition of memorial portraits of American troops killed in action in Iraq continues to travel across the country. Sadly, Arnold's exhibition continually needs updating as more troops fall in Iraq. But Chester Arnold and the group of artists that he has gathered continue to create poignant images with a humility and introspection that Rembrandt would understand. "Rembrandt's Late Religious Portraits" runs until August 28th and is accompanied by a wide range of lectures and events. To start things off at the Getty: Thursday June 9th at 7:00pm, Arthur K. Wheelock, Jr. - curator of northern baroque painting at the National Gallery of Art, Washington D.C. and organizer of the exhibition, discusses Rembrandt's late work and will explore the spiritual nature of the assembled paintings. As the evenings grow longer in late Spring and voices from the clubs down the hill from my studio drift in on the breeze, I feel a human quickening that the 17th Century Japanese poet Bashō would have understood. Art's ability to speak across the centuries never fails to inspire me and provide hope for the future. I am currently reading "Bashō's Haiku", translated by David Landis Barnhill. Barnhill's translations from the original Japanese are crisp. Each word is chosen carefully and the original verse order is maintained. These translations have an almost clipped brevity - like a Zen master's clap to focus his students. Barnhill's deft word choice allow Bashō's images to suggest layers of meaning without overlaying a modern American voice onto the poems. Matsuo Bashō (1644-1694) was born into the samurai class, but rejected that world after the death of his master and became a wandering poet and teacher. During his travels across Japan, he became a lay Zen monk and studied history and classical poetry. His own poems contain a mystical quality expressed through images from the natural world. Barnhill explains that " in the early 1690's, Bashō began to emphasize lightheartedness and day-to-day subject matter, promoting a new aesthetic of "lightness" (karumi)." The evening cool at riverside, Fourth Avenue," they call it. From early Sixth Month with its evening moon to the moon at dawn just past mid-month, people lining up along the river in platforms drinking sake and feasting as they party all night long. Woman wrapped in showy sashes, men sporting fashionably long coats, with monks and old folks intermingling, even apprentices to coopers and blacksmiths, everyone carefree and leisurely, singing up a storm. Yes indeed, life in the capital!